Windy City Wednesday Food Truck Festival. Every Wednesday 4 - 8 thru September 26. a fun, family orientated event that is held every Wednesday at the Sunrise Shopping Center in Casper Wyoming from 4 - 8. We have, licensed, insured and health department approved professional, food trucks, lined up and ready to serve you! 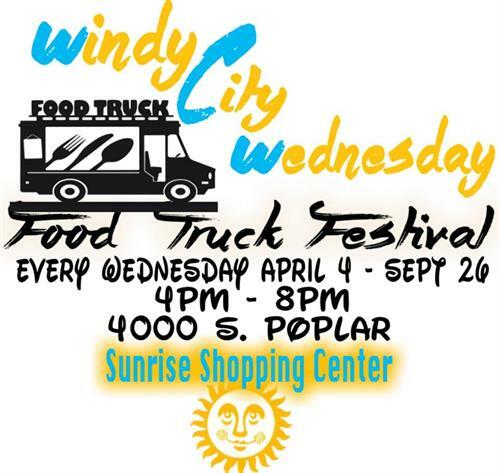 **Food Trucks and other mobile vendors are welcome at our Windy City Wednesday's Food Truck Festival. All vendors will be checked before being able to open. Any type of food truck / trailer vendor absolutely must be health department certified, as well as insured and licensed. **Don't sell food? ** Then, you don't need the health department. Cost? Call us for more info. It's more reasonable then you think. you need electric, you'll need to supply your own generator (generator must be under 72 decibels) Set up time is after 12:pm Wednesdays. No selling before 3:30pm. Must be in place no later than 3:30pm. Come prepared, (bring food, and lots of it) All vendors have to supply their own outside garbage can(s) at least one per vendor. No tearing down or leaving until 8pm.